"Moondust" redirects here. For the Commodore 64 video game, see Moondust (video game). For the album by The Pillows, see Moondust (album). For the psychoactive drug, see Phencyclidine. 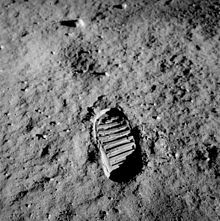 Lunar soil is the fine fraction of the regolith found on the surface of the Moon. Its properties can differ significantly from those of terrestrial soil. The physical properties of lunar soil are primarily the result of mechanical disintegration of basaltic and anorthositic rock, caused by continuous meteoric impacts and bombardment by interstellar charged atomic particles over years. The process is largely one of mechanical weathering in which the particles are ground to finer and finer size over time. This situation contrasts fundamentally to terrestrial soil formation, mediated by the presence of molecular oxygen (O2), humidity, atmospheric wind, and a robust array of contributing biological processes. Some have argued that the term soil is not correct in reference to the Moon because on Earth, soil is defined as having organic content, whereas the Moon has none. However, standard usage among lunar scientists is to ignore that distinction. The term lunar soil is often used interchangeably with lunar regolith, but typically refers to only the finer fraction of regolith, that which is composed of grains 1 cm in diameter or less. Lunar dust generally connotes even finer materials than lunar soil. There is no official definition of what size fraction constitutes "dust"; some place the cutoff at less than 50 μm in diameter, while others at less than 10 μm. Solar wind spallation and implantation: sputtering caused by impacts of ions and high energy particles. These processes not only form lunar soil, they also continue to change the physical and optical properties of the soil over time; this process is known as space weathering. In addition, fire fountaining, whereby volcanic lava is lofted and cools into small glass beads before falling back to the surface, can create small but important deposits in some locations, such as the orange soil found at Shorty Crater in the Taurus-Littrow valley by Apollo 17, and the green glass found at Hadley-Apennine by Apollo 15. Deposits of volcanic beads are also thought to be the origin of Dark Mantle Deposits (DMD) in other locations around the Moon. Lunar soil is composed of various types of particles including rock fragments, mono-mineralic fragments, and various kinds of glasses including agglutinate particles and volcanic and impact spherules. The agglutinates form at the lunar surface by micrometeorite impacts that cause small-scale melting which fuses adjacent materials together with tiny specks of metallic iron (Fe0) embedded in each dust particle’s glassy shell. Over time, material is mixed both vertically and horizontally (a process known as "gardening") by impact processes. However, the contribution of material from great distances is relatively minor, such that the soil composition at any given location largely reflects the local bedrock composition. There are two profound differences in the chemistry of lunar regolith and soil from terrestrial materials. The first is that the Moon is very dry. As a result, those minerals with water as part of their structure such as clay, mica, and amphiboles are totally absent from the Moon. The second difference is that lunar regolith and crust are chemically reduced, rather than being significantly oxidized like the Earth's crust. In the case of the regolith, this is due in part to the constant bombardment of the lunar surface with protons (i.e. hydrogen (H) nuclei) from the solar wind. One consequence is that iron on the Moon is found in the metallic 0 and +2 oxidation states, whereas on Earth iron is found primarily in the +2 and +3 oxidation states. The significance of acquiring appropriate knowledge of lunar soil properties is great. The potential for construction of structures, ground transportation networks, and waste disposal systems, to name a few examples, will depend on real-world experimental data obtained from testing lunar soil samples. The load-carrying capability of the soil is an important parameter in the design of such structures on Earth. Due to myriad meteorite impacts (with velocities in the range of 20 km/s), the lunar surface is covered with a thin layer of dust. The dust is electrically charged and sticks to any surface it comes in contact with. The density of lunar regolith is about 1.5 g/cm3. The soil becomes very dense beneath the top layer of regolith. Other factors which may affect the properties of lunar soil include large temperature differentials, the presence of a hard vacuum, and the absence of a significant lunar magnetic field (thereby allowing charged solar wind particles to continuously hit the surface of the Moon). There is some evidence that the Moon may have a tenuous atmosphere of moving dust particles constantly leaping up from and falling back to the Moon's surface, giving rise to a "dust atmosphere" that looks static but is composed of dust particles in constant motion. The term "Moon fountain" has been used to describe this effect by analogy with the stream of molecules of water in a fountain following a ballistic trajectory while appearing static due to the constancy of the stream. According to a model proposed in 2005 by the Laboratory for Extraterrestrial Physics at NASA's Goddard Space Flight Center, this is caused by electrostatic levitation. On the daylit side of the Moon, solar ultraviolet and X-ray radiation is energetic enough to knock electrons out of atoms and molecules in the lunar soil. Positive charges build up until the tiniest particles of lunar dust (measuring 1 micrometre and smaller) are repelled from the surface and lofted anywhere from metres to kilometres high, with the smallest particles reaching the highest altitudes. Eventually they fall back toward the surface where the process is repeated. On the night side, the dust is negatively charged by electrons in the solar wind. Indeed, the fountain model suggests that the night side would achieve greater voltage differences than the day side, possibly launching dust particles to higher velocities and altitudes. This effect could be further enhanced during the portion of the Moon's orbit where it passes through Earth's magnetotail; see Magnetic field of the Moon for more detail. On the terminator there could be significant horizontal electric fields forming between the day and night areas, resulting in horizontal dust transport - a form of "moon storm". This effect was anticipated in 1956 by science fiction author Hal Clement in his short story "Dust Rag", published in Astounding Science Fiction. There is some evidence for this effect. In the early 1960s, Surveyor 7 and several prior Surveyor spacecraft that soft-landed on the Moon returned photographs showing an unmistakable twilight glow low over the lunar horizon persisting after the Sun had set. Moreover, the distant horizon between land and sky did not look razor-sharp, as would have been expected in a vacuum where there was no atmospheric haze. 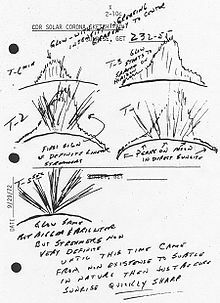 Apollo 17 astronauts orbiting the Moon in 1972 repeatedly saw and sketched what they variously called "bands," "streamers" or "twilight rays" for about 10 seconds before lunar sunrise or lunar sunset. Such rays were also reported by astronauts aboard Apollo 8, 10, and 15. These may have been similar to crepuscular rays on Earth. Apollo 17 also placed an experiment on the Moon's surface called LEAM, short for Lunar Ejecta and Meteorites. It was designed to look for dust kicked up by small meteoroids hitting the Moon's surface. It had three sensors that could record the speed, energy, and direction of tiny particles: one each pointing up, east, and west. LEAM saw a large number of particles every morning, mostly coming from the east or west—rather than above or below—and mostly slower than speeds expected for lunar ejecta. In addition, the experiment's temperature increased to near 100 degrees Celsius a few hours after each lunar sunrise, so the unit had to be turned off temporarily because it was overheating. It is speculated that this could have been a result of electrically-charged moondust sticking to LEAM, darkening its surface so the experiment package absorbed rather than reflected sunlight. However, scientists were unable to make a definite determination of the source of the problem, as LEAM operated only briefly before the Apollo program ended. It is possible that these storms have been spotted from Earth: For centuries, there have been reports of strange glowing lights on the Moon, known as "Transient lunar phenomena" or TLPs. Some TLPs have been observed as momentary flashes—now generally accepted to be visible evidence of meteoroids impacting the lunar surface. But others have appeared as amorphous reddish or whitish glows or even as dusky hazy regions that change shape or disappear over seconds or minutes. These may have been a result of sunlight reflecting from suspended lunar dust. A 2005 NASA study listed 20 risks that required further study before humans should commit to a human Mars expedition, and ranked "dust" as the #1 challenge. The report urged study of its mechanical properties, corrosiveness, grittiness, and effect on electrical systems. Most scientists think the only way to answer the questions definitively is by returning samples of Martian soil and rock to Earth well before launching any astronauts. Possible damage to an astronaut's lungs, nervous, and cardiovascular systems. The principles of astronautical hygiene should be used to assess the risks of exposure to lunar dust during exploration on the Moon's surface and thereby determine the most appropriate measures to control exposure. These may include removing the spacesuit in a three-stage airlock, "vacuuming" the suit with a magnet before removal, and using local exhaust ventilation with a high–efficiency particulate filter to remove dust from the spacecraft's atmosphere. The harmful properties of lunar dust are not well known. However, based on studies of dust found on Earth, it is expected that exposure to lunar dust will result in greater risks to health both from direct exposure (acute) and if exposure is over time (chronic). This is because lunar dust is more chemically reactive and has larger surface areas composed of sharper jagged edges than Earth dust. If the chemical reactive particles are deposited in the lungs, they may cause respiratory disease. Long-term exposure to the dust may cause a more serious respiratory disease similar to silicosis. During lunar exploration, the astronauts' spacesuits will become contaminated with lunar dust. The dust will be released into the atmosphere when the suits are removed. The methods used to mitigate exposure will include providing high air recirculation rates in the airlock, the use of a "Double Shell Spacesuit", the use of dust shields, the use of high–grade magnetic separation, and the use of solar flux to sinter and melt the regolith. The Apollo astronauts brought back some 360 kilograms (800 pounds) of lunar rocks from six landing sites. Although this material has been isolated in vacuum-packed bottles, it is now unusable for detailed chemical or mechanical analysis—the gritty particles deteriorated the knife-edge indium seals of the vacuum bottles; air has slowly leaked in. Every sample brought back from the moon has been contaminated by Earth’s air and humidity. The dust has acquired a patina of rust, and, as a result of bonding with terrestrial water and oxygen molecules, its chemical reactivity is long gone. The chemical and electrostatic properties of the soil no longer match what future astronauts will encounter on the moon. Moon dust-contaminated items finally became available to the public in 2014, when the US government approved the sale of private material owned, and collected, by astronauts. Since then only one item has been produced for sale with genuine moon dust collected after the item spent over 32 hours on the Moon. A luggage strap, exposed to the elements of the Moon for 32 hours, a piece of Charles "Pete" Conrad's spacesuit on the Apollo 12 mission, was sold by his estate to a private purchaser at auction. In 2017 lunar soil collected by Neil Armstrong in 1969 was put up for auction. While many jewelry- and watch-makers claim their product contains "moon dust", the products only contain pieces of, or dust from, meteorites believed to have originated from the Moon. ^ Heiken; Vanniman & French (1991). Lunar Sourcebook. Cambridge University Press. p. 756. ISBN 978-0-521-33444-0. ^ Naeye, Robert (6 April 2008). "NASA Scientists Pioneer Method for Making Giant Lunar Telescopes". Goddard Space Flight Center. Retrieved 27 February 2011. ^ Park, J.S. ; Y. Liu; K. D. Kihm; L. A. Taylor. "Micro-Morphology And Toxicological Effects Of Lunar Dust" (PDF). Lunar and Planetary Science XXXVII (2006). Retrieved 8 March 2007. The particle size distribution of the lunar dust from Apollo 17 sample 77051 has been determined using SEM imaging analysis. The size-distribution data features an approximate Gaussian distribution with a single mode at around 300-nm. The reactivation surface area of highly porous “Swiss-cheese” particles is about 26% higher than a sphere. The morphologies of dust grains have been classified based upon their four types: 1) spherical; 2) angular blocks; 3) glass shards; and 4) irregular (ropey or Swiss-cheese). These data will assist the medical researchers in their studies of the toxicological effects of inhalation of lunar dust by humans. ^ Young, Kelly (6 March 2007). "Lint rollers may collect dangerous Moon dust". New Scientist. Retrieved 17 February 2008. While hailed as a potential source of oxygen and metals, Moon dust is a concern because doctors fear the smallest grains could lodge in astronauts' lungs, possibly causing long-term health effects. ^ "Moon dust collected by astronaut Neil Armstrong to be sold at auction". ITV News. Retrieved 13 July 2017. 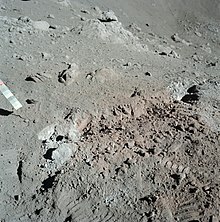 Wikimedia Commons has media related to Lunar soil.